It’s no secret Frank and I love road trips… We love the freedom of having my own wheels, exploring off the beaten track places and pulling over whenever I want to take a picture (which happens a lot). Our 6 week road trip around New Zealand was one of the coolest trips of our life, so when I started doing research for our journey to Japan, it was already decided this would include a road trip as well. As I was putting our one month Japan itinerary together, it became pretty clear that Hokkaido would be our road trip destination. If I wasn’t already convinced by the pretty pictures of stunning volcanos, the fact that Hokkaido covers 20% of the total land area of Japan while only 5% of the total population lives there did. One of the many reasons I fell completely and utterly in love with New Zealand was the wide view of mountains and not a single sign of civilization. Roads where you did not come across another car in a 3-hour drive… I was hoping to find this on Hokkaido as well. And wow, Hokkaido is beautiful! Though not as untouched as (parts of ) New Zealand, Hokkaido is untamed and truly gorgeous. When I was researching Hokkaido and our road trip itinerary, I discovered not much has been written about driving in Hokkaido. I usually find a couple of travel blogs that contain useful information, but for a Hokkaido road trip not so much. 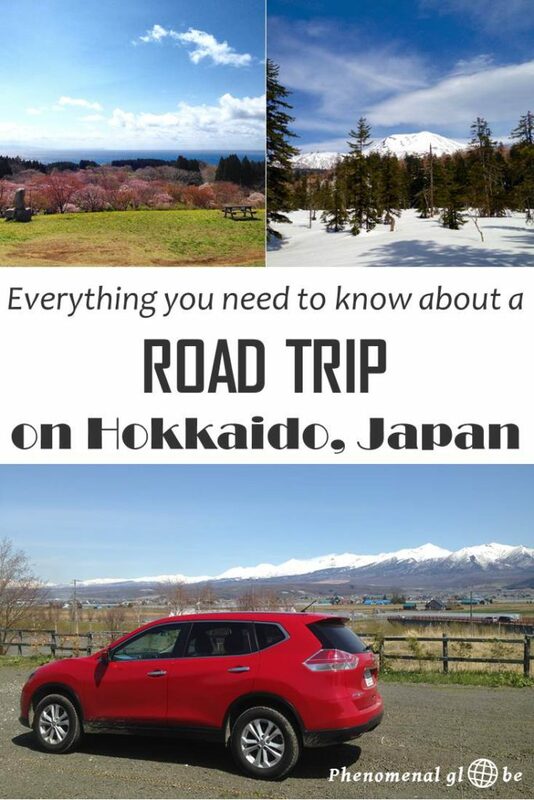 To fill that gap, I’ve written this post to tell you everything you need to know about driving and renting a car on Hokkaido☺. Driving around Hokkaido is great and getting your own wheels is highly recommended on this wild Japanese island. Particularly if you are into hiking like me, having a car makes it much easier to reach the many hiking trails you can find on Hokkaido. 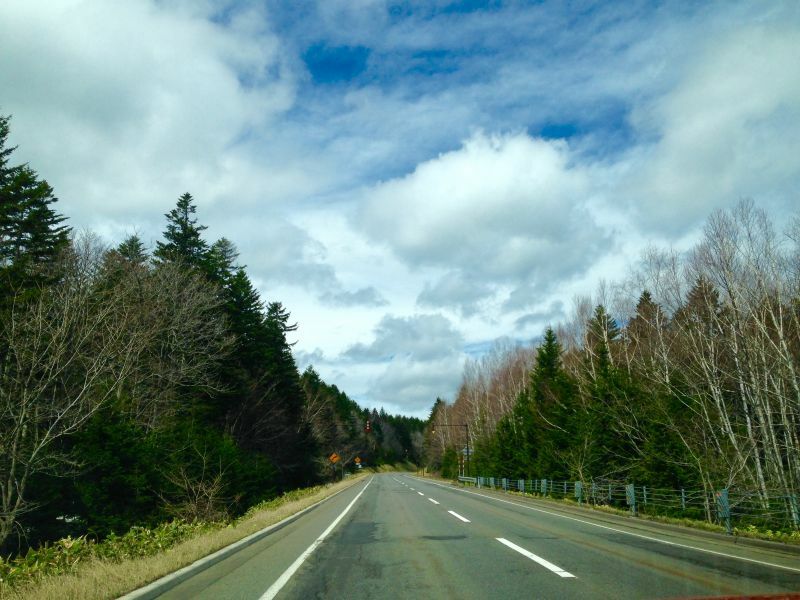 In general, driving in Hokkaido is very easy and straightforward. But there are some things which are important to know before setting off onto your dreamy Hokkaido self drive road trip. What is the best time to visit Hokkaido? If you plan to rent a car on Hokkaido I recommend to avoid traveling in winter time. Actually, let me put that differently: only rent a car on Hokkaido in winter when you know what you are doing! Driving on Hokkaido in winter is not easy and can be very dangerous. Roads can be very slippery or completely blocked. If you do want to drive in winter, prepare well and make sure you have snow chains, a blanket, water and some food when you hit the road. Average temperatures in December, Januari and February are below zero, but keep in mind winter sometimes lasts until April on Hokkaido. 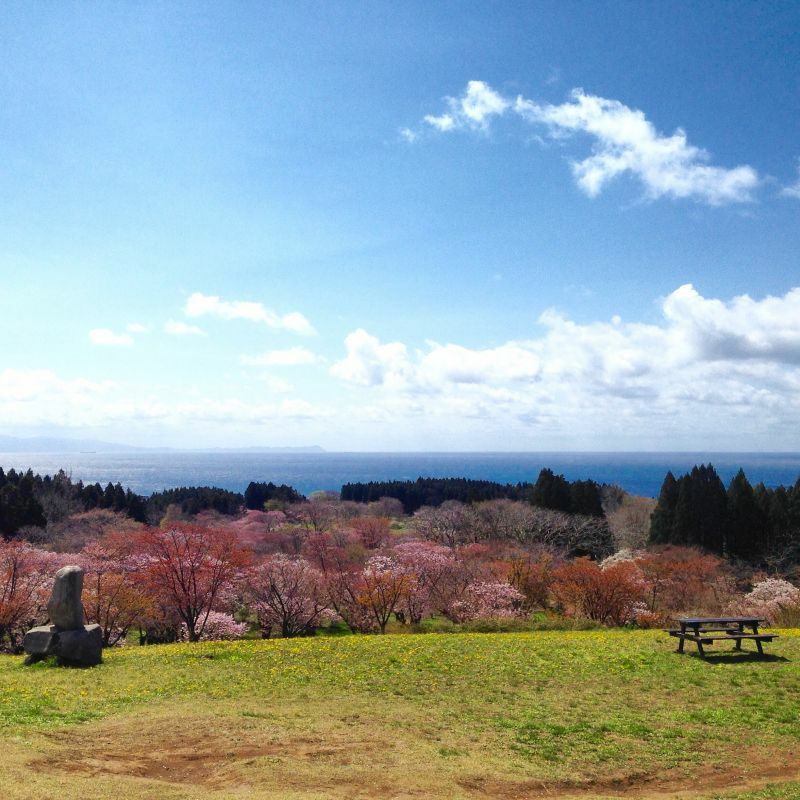 We visited at the end of April/start of May and I think Spring is a great time to visit Hokkaido. We got to see the cherry blossoms (Sakura), but also hiked in the snow. Some days were sunny and warm and we could comfortably wear a t-shirt. Other days temperatures were only a couple degrees above 0 (Celsius). Be sure to bring thermal underwear and lots of layers. If you plan to go camping, check my Japan camping packing list and make sure to bring a very warm sleeping bag! Spring is a very nice time to visit Hokkaido, especially May and June. In April many restaurants, attractions and campsites are still closed, most of them open during Golden Week, Japan’s national holiday. Golden Week can be extremely busy so if you plan to travel during this period, make sure to book a hotel in time (or go camping like we did). July and August are the busiest months on Hokkaido, mostly because of the famous flower fields near Furano. The best time to visit the flower and lavender fields is mid to late July. Autumn is also a very nice (and popular) time to visit Hokkaido. Hokkaido is a famous ‘leave’ spot, you can actually check the Foliage Forecast or Autumn Color Report on Japan Guide to plan the best time for your visit. You cannot rent a car if you don’t bring an international driver’s license with you (and your national license as well!). More specifically, Japan only recognizes international driving permits based on the 1949 Geneva Convention. Make sure to check if your country provides such a license beforehand and bring the right documents! Japan is one of the few countries outside of the former British Empire where people drive on the left, you can read more about the reasons behind this peculiarity at Wiki. For many people, including myself, driving on the left is the exact opposite of what they are used to. So be careful! Driving in Hokkaido (and everywhere in Japan) is excruciatingly slow… While the roads are in excellent condition and traffic is very light outside cities, speed limits are very strict. While the 100km/h on the Expressway (I’ll explain more about the Expressway later on in the post) isn’t actually that bad, the parts where we could actually drive 100km/h can be counted on one hand. The electronic signposts kept saying the speed limit was 70km/h instead of the 100 km/h mentioned in the information leaflets. And 70km/h on an empty road feels slow… Very slow! Nobody seemed to keep those limits except us, but we didn’t want to risk a speeding ticket and thus caused a lot of traffic jams (read annoyed Japanese drivers who got stuck behind us, the ignorant gaijin who obeyed the ridiculously low speed limits). I highly recommend reading this very extensive guide about driving on Hokkaido for more details about speed limits and traffic rules and regulations. You can read more about driving in Japan in general on Japan Guide, which is the go-to website for everything you need to know about Japan. Hokkaido is big… And as I mentioned above, driving is slow. In villages there are a gazillion traffic lights and the speed limit varies between 30 and 50 km/h. The alternative is the Hokkaido Expressway, a toll road, which in my opinion is worth the extra money you have to pay because it saves you a lot of time. Luckily, Japan has all sorts of attractive discounts available to foreign visitors, one being the Hokkaido Expressway Pass. This pass allows you to drive on all the Expressway toll roads for a fixed fee. So instead of paying for every little piece of expressway you drive on, you pay a fixed daily fee for unlimited use of the Hokkaido Expressway. You can find information about fees and other useful information about the pass at this website. What’s important to know is you have to rent an ETC (meaning Electronic Toll Collection) card, this card is provided by pretty much all the rental companies in Japan. The Hokkaido Expressway Pass is registered onto your ETC card and enables you to pass through the ETC booth on the Expressway. 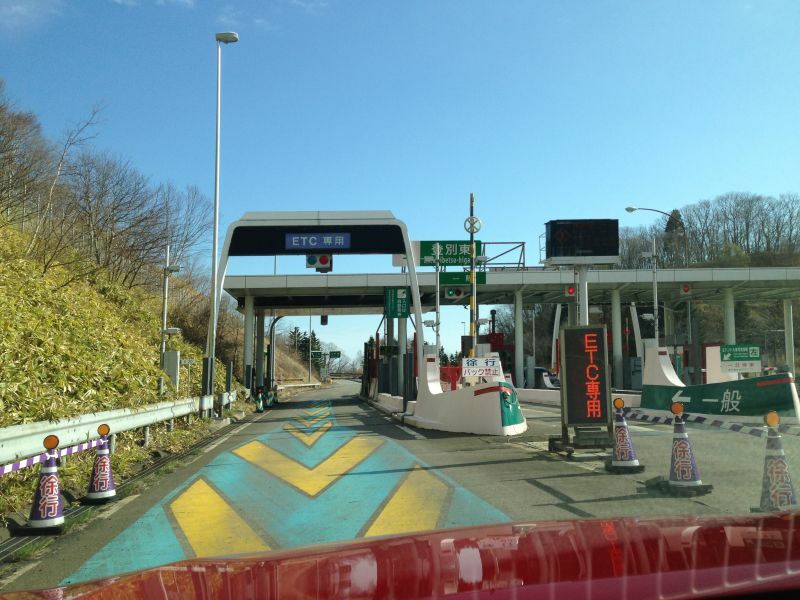 In other words, you don’t have to stop every time you enter or leave the express way, you just drive through the ETC lane (slowly), the machine reads your card containing the Hokkaido Expressway Pass and the gate opens. Easy peasy. 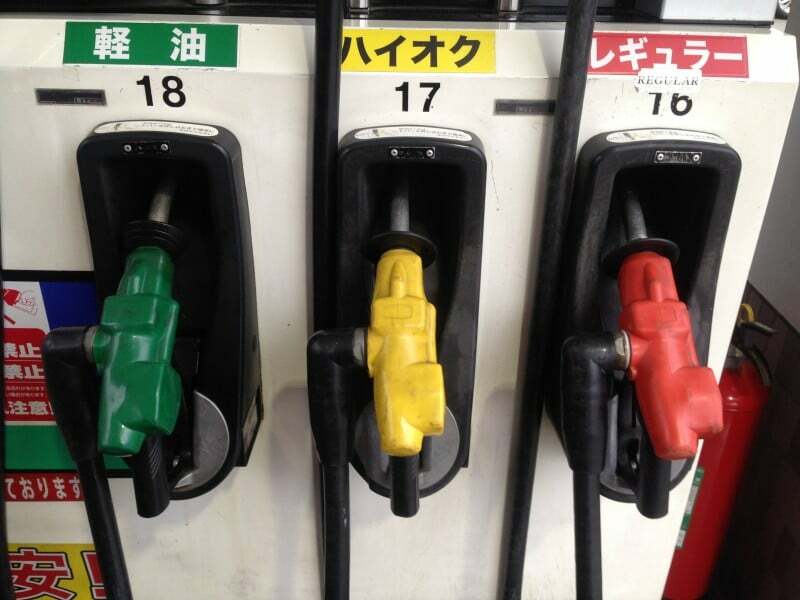 In Japan, the different types of fuel are color coded which made filling up our tank with the right fuel very easy. Yellow is hi oku (high octane), red is regular and green is diesel. Mantan means full tank in Japanese. I have to admit I did not actually do any work myself because many gas stations are fully serviced. The very friendly and helpful staff working at these stations did all the work for me. I felt a bit useless, standing next to the car and watching how one person was filling the tank while the other was cleaning off some tiny mud specs of the back of our car… But definitely great service! 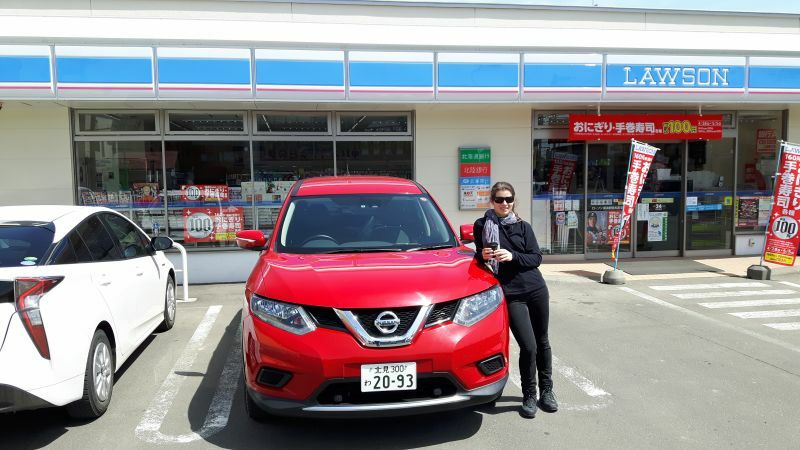 My map reading skills aren’t bad but my Japanese is limited to say the least… Therefore I was very happy to rely on our GPS when road tripping around Hokkaido. The great thing about Japanese GPS systems is you can put in a phone number as a destination. No need to read complicated Japanese Kanji characters! In the app you can find all the onsen (even the natural ones), campsites and other places to stay, road stations and even offline maps! We had to drive to a 7-11 one night because there were no restaurants or other shops nearby and we were hungry. It was dark, extremely dark. Except for lots of shimmering eyes reflecting the light of our headlights. Eyes belonging to deer grazing by the side of the road. Deer you do not want to hit with your car. So avoid driving in the dark, it’s dangerous (and very uncomfortable as well). Make sure to have a bit of back-up food and find a place to spend the night before darkness falls! I will start by saying ToCoo provided me with a free rental car for my 10 day trip around Hokkaido. However, I would never recommend a product or service on my blog I don’t have a positive and personal experience with, and my experience with ToCoo is excellent! I would have rented my car from ToCoo even if they hadn’t offered me a free car, simply because they offer the best rates and value for money. Also, ToCoo is one of the car rental companies recommended by Japan Guide so I know it’s a trustworthy company. It’s easy to make a reservation online and I was very satisfied with the customer service. When we arrived at Hokkaido airport it was very easy to find the Nissan desk (ToCoo offers cars from several brands). The kind lady behind the desk found our reservation in a matter of seconds and escorted us to the (complementary) shuttle bus driving us from New Chitose airport (Sapporo) to the Nissan outlet. At the Nissan outlet we signed the insurance paperwork, bought the Hokkaido Expressway Pass, got the key to a shiny red Nissan X-Trail and off we went! Bringing back the car was just as easy, we filled up the tank, handed back the key, paid the insurance fees and were taken to the airport with the shuttle bus. Easy and effortless. As I stated above, my car was provided by ToCoo. That doesn’t mean driving around Hokkaido for 10 days was free. 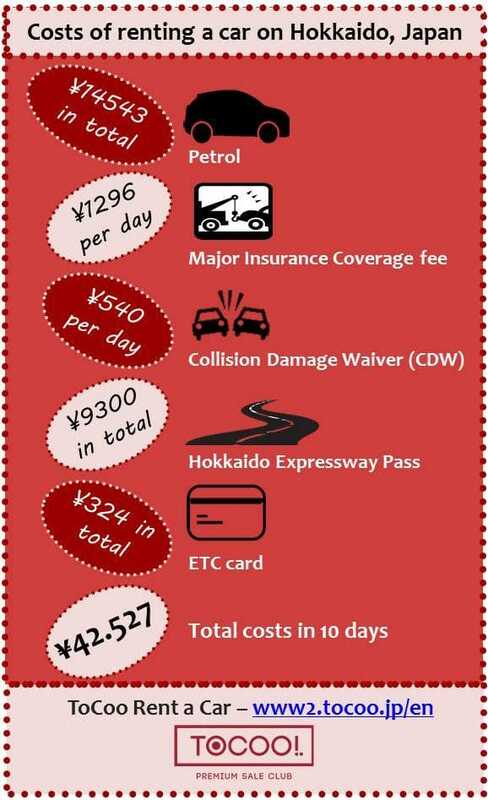 As you can see in the infographic, the costs of our Hokkaido rental car are split into 5 categories. Petrol ⇒ between ¥112 and ¥119 per liter of fuel. Major Insurance Coverage fee ⇒ required. Collision Damage Waiver (CDW) ⇒ optional, having this gives me peace of mind. Hokkaido Expressway Pass ⇒ optional, but worth the money in my opinion. ETC card ⇒ optional, but required if you want the Hokkaido Expressway Pass. The total cost of renting a car for 10 days was ¥42.527, which comes down to ¥4253 (€34/$39) per day. Add to this the daily rental fee of the car you would like to rent and you have your total. 1. 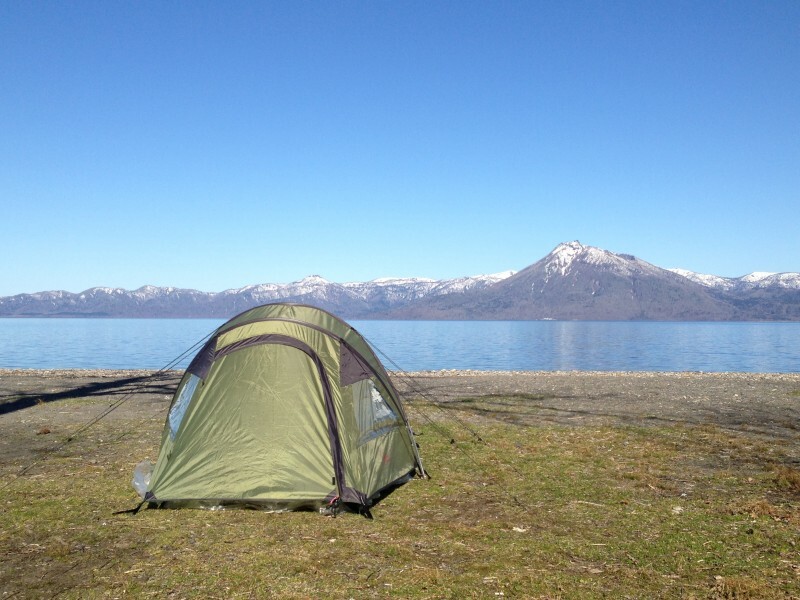 Go camping with a tent (we paid between ¥400 – ¥800 per person per night). 2. Sleep in your car (free). This will save you a lot of money on accommodation in Japan! You can read all about the costs of traveling in Japan in this post and check out our Hokkaido road trip itinerary here. You can download the infographic about the costs of renting a car below. 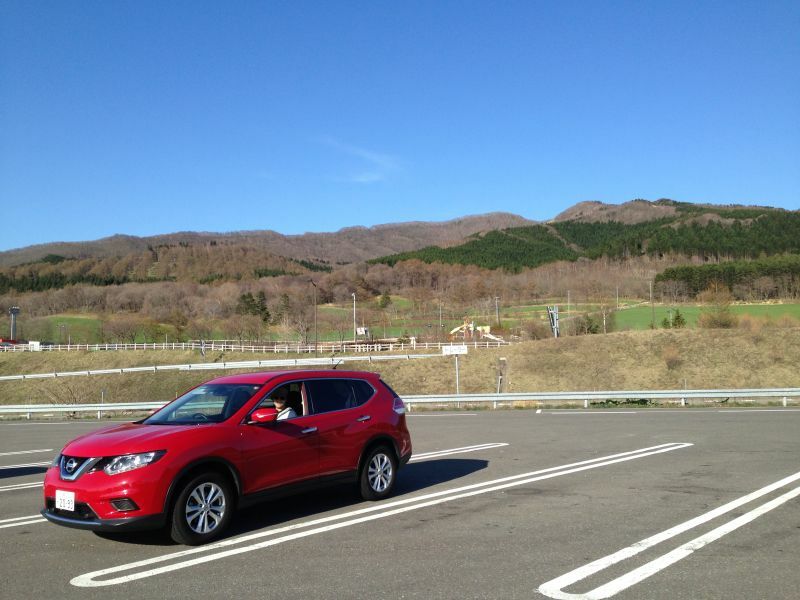 Enjoy your self drive road trip on Hokkaido! This is a really great guide! Driving in a foreign country is a whole new experience that definitely takes some getting used to. This post could be a great resource for Japan visitors! Thanks so much for sharing this! My son (11) and I just finished a month long road trip to Florida from Colorado. What I love most about road trips is that it forces you to be part of the local scene; meet others in their daily lives. Hopefully we will hit Asia in the next year to do the same. Haha true, it felt sooooooooo slow;-). Thanks, glad you like the guide! Thanks so much Liz! I am sure you would love Hokkaido, beautiful scenery and amazing food;-). Perhaps we can take our next road trip there together! Ur posts are indeed details and helpful! Appreciate if u can advice on my coming trip to Hokkaido in this early December. We planned to stay in Hokkaido for 7 nights from 5/12 to 12/12 with a group of 4 adults n 5 kids (2 of them below 5yrs old). Initially we wanted to self drive, but after reading ur posts we changed our mind coz we have no snow driving experience. Do u happens to have any itinerary which can be accessible by public transport? We planned to visit the zoo (famous with penguin walking) and maybe some good Onsen. We also hope to visit a ski resort to let the kids ski. Still never been to Hokkaido, but the words Road trip made the northern island the top of my Japan bucket list for next time I have the chance. True that, 70km/h feels so slow driving for top speed. Renting a car or bike really makes travel to certain places less frustrating. Some places it makes a world of difference! What I love about Japan is it is ultra modern and ultra traditional at the same time. Think the car would be the best way to see the more rural side of this amazing country. What would you suggest doing? what experience you think will be more enjoyable? Came across your article and I was curious as to how you can even get a license to drive to other countries 🙂 your post answered how. though I’m not too confident about driving in Japan because I’m used to having the driver’s side on the right. I think Japan’s on the left if I’m not mistaken? Thanks for sharing this! Aiming to visit Tokyo by the end of this year. Hope I can fit in Hokkaido on the trip. Cheers! 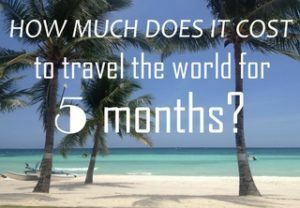 Do you think that a month is too long? Should we split it with Tohoku? Which time would you recommend: all of June or mid June to mid July? 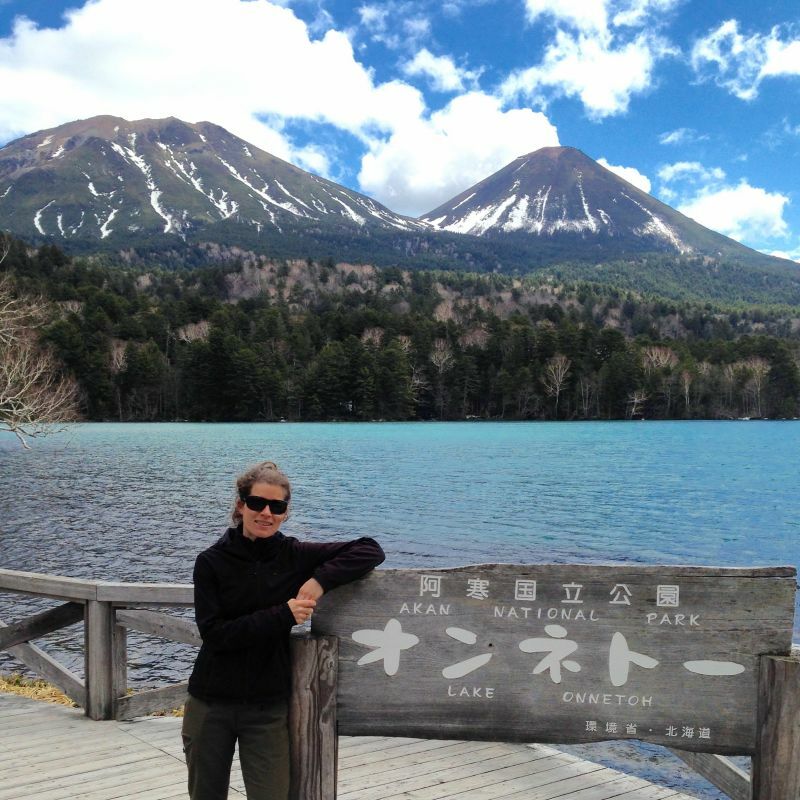 Hi Cindy, so cool you’ll be spending 30+ days on Hokkaido! I think you can easily spend a month there and not be bored, it’s a big island and it can take a long time to get somewhere (due to the low speed limits). I personally haven’t been to Tohoku, but I’m sure that will be beautiful too. You could always start on Hokkaido and see how long you like it there. About the time period, I think it depends on the type of hike you want to do. The Shiretoko Traverse is usually just accessible in July and August. On the other hand, July is also high season for Japanese tourist so June may be a bit more quiet. I wish you an amazing trip! And please let me know if you have more questions:-). What an excellent guide for travelling in Japan. A road trip is one of the best ways to practice slow travel. I also want to share one App which is very helpful, especially when you are on your road trip, might be you are the already aware from it, Wiffinity is one of the great application which can help you to understand the local areas. It will guide you bitterly when you are travelling to an unknown place. Hi Gilbert, thank you for reading and I’m happy to hear you like the post. 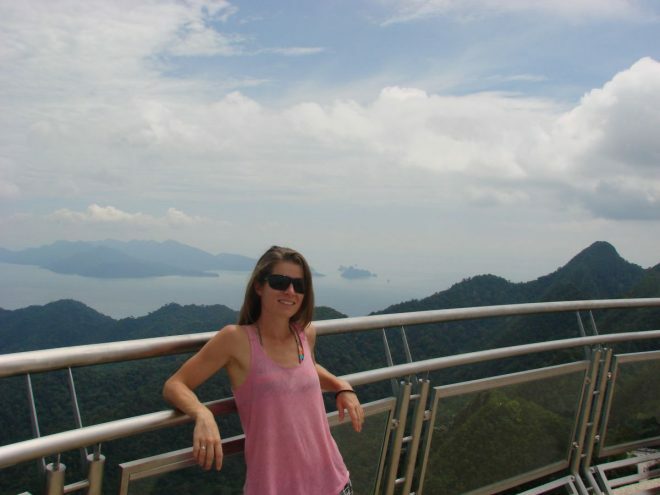 It’s my mission to help people plan their trips and always nice to hear I am succeeding in this goal:-). I am planning to visit Australia later this year and a road trip is definitely the way to do it! I do not understand Japanese at all, is it still okay to self-drive in Hokkaido? I can assure you it is! I don’t speak ANY Japanese at all and we managed fine. Sometimes it takes a bit of signing and mining but Japanese people are extremely friendly and willing to help:-). Enjoy your trip! Great share! And thanks for all the useful tips on the driving in Hokkaido. May i know which month is it when you visit Hokkaido? Good article! Mentioned in detail measures taken before renting a car on Hokkaido. I have one question which was not answered in the post: is it possible to take car rent service with a driver on Hokkaido island? I am not expert driver and want to visit different places. Good question! 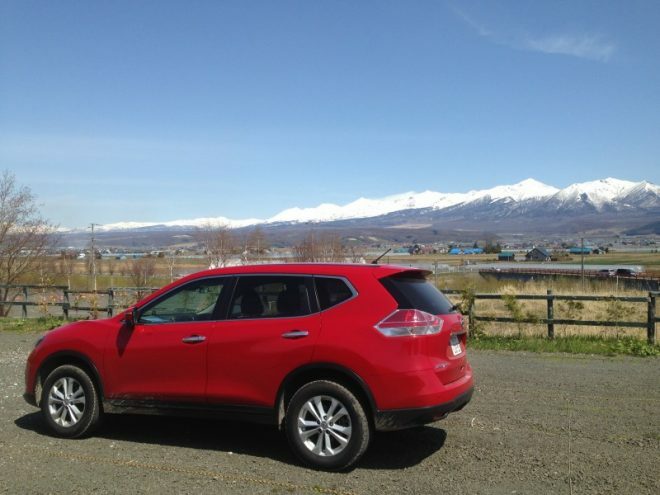 I have no personal experience with renting a car with a driver on Hokkaido but in this Tripadvisor post you can find useful links to charter companies who may be able to help you out: https://www.tripadvisor.com.au/ShowTopic-g298143-i5078-k10604072-Car_hire_with_driver-Hokkaido.html. You could also look into public transport, I think this will work out to be cheaper than a car with a driver. I have to stress that driving on Hokkaido is not difficult, the roads are great and there isn’t that much traffic. Whatever you decide, have a great trip! I and my wife intend to spend 7 to 8 days summer holidays in Central Hokkaido. 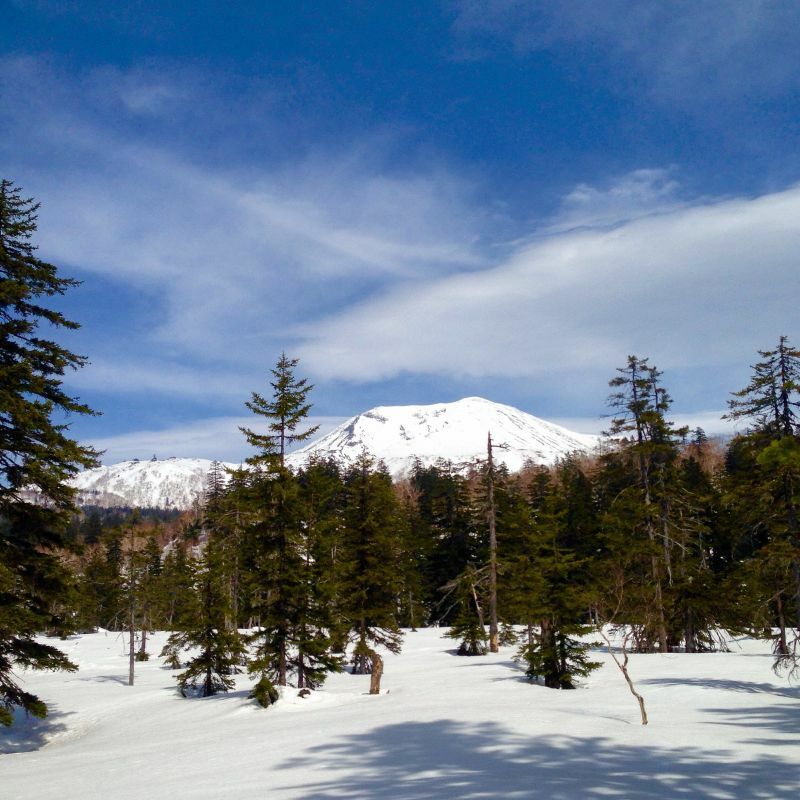 Places like Furano, Biei, Otaru, Lake Toya, Noboribetsu etc by a rented car. We would appreciate if you could highlight where I should start our journey with a self drive car and return the car one day before flying home. Preferable we would like to spend at least a night stay having a relaxing holidays at those locations. Is there a age limit to rent a car in Sapporo as I am already 65. We prefer a simple and nice hotel or home stay with breakfast and hope you could show us as well. Thank you very much and your recommendations and suggestions are much appreciated. Thank you for reading my blog and how exciting you’ll be traveling to Hokkaido this summer. It’s such a beautiful rugged island, I’m sure you will love it! About your questions, you can check out my itinerary here: https://www.phenomenalglobe.com/hokkaido-road-trip-itinerary/. This should give you an idea of a feasible itinerary, you may have to skip Lake Akan/Hakodate since it is quite a drive and may not fit into your 7-8 days. I’m not aware of any age limitations for car rental, but if you want to make sure you can always ask the rental company you are planning to use. In this post: https://www.phenomenalglobe.com/where-to-stay-in-japan-on-a-budget-accommodation-guide/ you can find my accommodation recommendations. We also camped and slept in our car but there is plenty of accommodation you can find via Agoda, Booking or Airbnb. I (together with 2 friends) will be in Hokkaido/Sapporo from 18th May 2018 until the 25th May. I have already booked our accommodation; we’ll be staying in Furano (2 nights),Shiraoi (2 nights); Sapporo (3 nights). My question is, if we rent a car and on the departure day my flight is in the morning (9.30am), can we arrange a hotel transfer to the airport? Thank you for reading my blog and I hope you have a great trip on Hokkaido! We also had an early flight from Sapporo airport and stayed at Hotel Areaone Chitose, they offered a complimentary transfer to the airport. My advice would be to check with the hotel you booked to ask about the possibilities, most hotels in Sapporo do offer a transfer. If not, the bus system is also very efficient so it shouldn’t be a problem to make it to the airport in time for your flight. Thanks you for the great post. My husband and I are planning a trip there over the summer. We will also rent a car. Do you have any recommendations for places to visit There are so many! Thank you for reading! For inspiration about places to visit you can check out my Hokkaido itinerary post: https://www.phenomenalglobe.com/hokkaido-road-trip-itinerary/. Have a great road trip! Lotte, this blog really made my vacation in Hokkaido an epic experience. It would not have been possible without all the info you mentioned. Picked up the express pass for the toll roads at the rental car shop. stayed at a capsule hotel in downtown. Parked across the street in parking garage. In the morning went to a huge camera shop at the main train station and picked up a cell phone sim card that provided internet for 30 days. THe car gps can be hit and miss for an English only traveler. It will auto select surface streets rather than expressways for directions. You’ll need to be use road signs to enter expressways. On the way up to Shiretoko area surface streets were fine to see daily life and driving through towns. BUt on the way back I found the expressways well worth it to save time and cutting across vast distances effortlessly. Used google maps and internet based japanese to english translator as backup. THe 7-11 stores had great coffee that brews a cup on order. Two things that I made sure to do every day was to visit an onsen and order a bowl of ramen. Most of my destintions were national parks and they well worth it. Mostly Japanese campers, didn’t see any foreign campers during my visit. Be sure to pick up a small tarp at a hardware store to keep under the tent at night. If it rains, you’ll be just as dry in the morning. Shopped at the mega stores for supplies and left much of the food behind when I left. BOth were highlights to the trip and were easy to find using the internet on the cell phone to locate what I wanted. I found the best onsens for me were in natural settings where the water was not heated but naturally hot coming from the ground. Returning home(trip was early july 18), many people would tell me they were in Hokkaido before but none had stories outside Sapporo. THe rental car really allowed me to get out and about away from the sites frequently traveled for my own personal Hokkaido experience. 1. Use google maps for navigation but select the “Avoid toll” option to save a TON of money express pass. The trip will bit a longer, but sure worth it. Somehow they added all the onsens (even the natural one’s) , places to sleep and even offline maps! Pure gold.